All events are schedule for 9PM EST. Artists must register ahead of time online to perform. To sign up for the Open Mic event, visit the Miami LIVE website to register. A recap of one of some previous performances from Open Mic events can currently be viewed online. 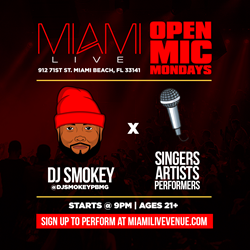 Artists and performers can sign up to perform at the next show on Miami LIVE's event page on their official website. Miami LIVE is an exclusive live music rental venue that includes a bar & recording studio. The venue is located on Miami Beach and specializes in Live Music, Concerts, DJ/Club Events, Birthdays, Corporate parties and much more. The main floor offers 3,800 sq. ft of floor space to accommodate most event and concert needs, and the second floor is dedicated to the Recording Studio, with a 600 sq ft space including green room and large 6×8' isolated booth. Miami LIVE offers an array of packages to fit any budget. Miami LIVE is currently taking booking for rental space and recording session on the Miami LIVE website.